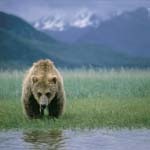 Alaska Brown Bear photo gallery: browse our Alaska wildlife photo collection for pictures of the Alaskan brown bear, Alaska Grizzly bear, Kodiak bears and more. There is hardly any place in the world which is as thinly populated as Alaska. Large parts of the country are still dominated by the animal world. 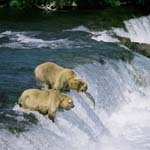 This is also true for the huge Katmai National Park in the south of Alaska, where the landscape is marked by glaciers and volcanoes, a part of which are still active. At the bottom of the tops of the Aleutan Range which are up to 2,000 metres high lies the flat and stormy Shelikof Strait. The hardly accessible coastal landscape is a Dorado for animals. This is the bear country .... The Waters – a former research vessel – is our base camp and we are anchored in the Hallo Bay. At the moment the tide is out, and a bear is wandering along the beach on the search for mussels. 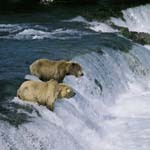 It is an "Alaskan Brown Bear", as the animals are called along the coast. A subspecies of the Brown Bear lives in the heartland and is called „Grizzly“ (Ursus arctos horribilis). It is much smaller than the bears on the coast and is known to be aggressive against humans. This happens mainly if the humans do not comply with the rules which need to be observed while staying in their territory. In these cases accidents with Grizzlies make for horror stories and headlines every now and then. In general, however, Grizzlies are – just as the big Brown Bears on the coast - shy and placid creatures, which love their peace and quiet more than everything. Our Master Bruin is especially interested in the "Razor Clam". With its distinct sense of smell, under the sand it seeks out the mussels of up to 15 centimetres and digs them out. But it needs to hurry, because the mussel notices the danger and digs itself quickly into unreachable depths. If it gets hold of a mussel, it opens the mussel with teeth and claws. Two years ago, when we were with the bears at McNeil River, on Kodiak and Katmai, people at the Brooks Camp warned us insistently of the wild coast at which we are right now. They told us that there would be a particularly large number of big and very dangerous animals. And what did we find on the rough western coast of the Shelikof Strait? 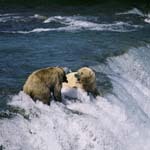 On the beach there were bears searching for mussels and on the grassland peacefully grazing bears. We never had any problems with them. Certainly there are rules of conduct in the Bear Country. Food in or near the tent is an absolute no-no. Even toothpaste, lotions and cosmetics are an irresistible attraction. The distances to be observed of 50 yards to an individual animal or, respectively, 100 yards to a mother bear with a cub are justified. In the well-attended Brooks Camp, for example, people see to the adherence to a safety distance. At least by the humans. The Brownies do not always adhere to it ... As we are wandering around a curve we are standing in front of a huge green. Bears! I count them amazed: eighteen bears are on the grassland! We are carefully approaching an animal, which is standing aside, directly in front of a steep, overgrown rock face, off which the water is rushing in long threads. The big Brown Bear chooses the most tender grass. As it notices us, it slowly approaches us. A fox is passing quickly with a bird in its mouth. Indifferently, the bear gazes after it. Then it focuses on us again, but in the end the grass seams to be more interesting to the bear: slowly it trods back to its rock face. The rain has stopped, the sun comes out – but again only for a short time. 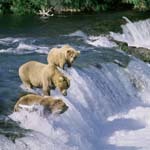 We spend hours of quietness in this river landscape, surrounded by bears. The Waters is already waiting for us. At night we anchor near the Shakun Rock. The weather forecast does not sound good, and we have to leave the island in heavy seas still in the late afternoon. The wind force is constantly increasing, and we are glad as we reach the Kukak Bay. We go very deep into the bay, anchoring in a sheltered place, because the storm is already raging on the open sea. The Shelikof Strait is notorious. Aboard I read in a report that there are years with 23 days of storm per month, with waves of three, six or even ten metres. We spend two days in this place in rain and wind. There is a short weather improvement afterwards, and a small floatplane can pick us up. Despite the bad weather in the Shelikof Strait, we got to know a unique landscape with a rich fauna and flora. 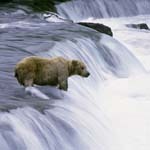 As for the big bears of Alaska: in hundreds of encounters with them we have only met placid animals. At the McNeil River, on Kodiak, at the Brooks River, the Katmai "back country" and at the Shelikof Strait. For us, they embody untouched wilderness and they fascinate us enormously. 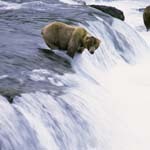 Nevertheless, one should never forget that bears are extraordinarily powerful and fast animals. An erect Brown Bear can reach a height of three metres. 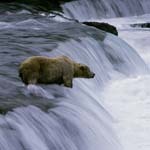 On Kodiak there are animals with a weight of up to 800 kilograms! At an attack from close range, humans have no chance. The bears we got to know had a good to abundant food supply. Also, they were not spoilt by humans. Perhaps, these circumstances had an influence on their placid behaviour. For the Grizzlies in the heartland, the food supply is much worse. Their living conditions are hard. A disregard of the basic safety rules in their territory can have fatal consequences. Fatal attacks against humans in the Yellowstone and the Glacier National Park document this insistently. With all the fascination – caution is always advisable with these animals.